Building a fan base on Facebook can be something that you gradually grow or something that catches on like wild fire. 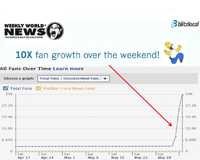 Here’s how Weekly World News multiplied their fan base in a matter of four days. When we took over the Facebook Fan page for Weekly World News , they had 3,244 fans. 4 days later, we had 40,310 fans– 10 times larger. How We Got To 40,310 Facebook Fans In 4 Days. Meaningful relationships are highly sought after treasures, but friendship is taking on a different meaning in a social media world where it has become a race to have the most friends who can be dropped like a bag of soggy chips. Earlier this year Harvard Professor Greg Mankiw reached the limit of Facebook’s friend list after using his account “for the soul purpose of accumulating ‘friends’.” Then he promplty shut down his account (or at least tried). I don’t really care whether Mankiw wants to be on Facebook, but I think it’s an interesting example of how friendships have become a bulk commodity. Has social media turned friendship into more of a numbers game and less about real relationships? Personally, Facebook is a tool for staying in touch with friends old and new, kind of how Christmas cards or family newsletters use to be. I use Facebook more as a means to stay in touch and share ideas now and again, but call me old fashioned…I’d rather you send an e-mail than post a message on my wall or send it through Facebook. I am exploring ways to use Facebook for it’s great group and event capabilities which. So, does Facebook enhance or water down the relationships in your life? For me, Facebook makes me feel closer to people I haven’t seen in years, and it gives me conversation starters and tidbits of information (photos, videos, comments) about my nearby friends that comes in as good conversation starters when we hang out. So, despite the expanding connectinos to friends old and new, I think Facebook can do a lot for connecting friends. For actually building relationships, there’s still nothing like a good face to face conversation. Advertising on Facebook is convenient, easy to setup and can be pretty effective! We can select a specific audience by age, location, interests, etc. and then bid on how much we are willing to pay per click that we get. A nice thing is that we can limit our expenses per day so we don’t go over budget. For our leadership conference we wanted to get the news out to the online crowd. Using Facebooks advertising we made one (see at right). 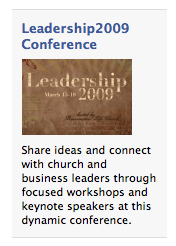 We’ve drew about 13% of those who came to our leadership site through this ad. To track traffic to our websites we make use of Google’s Analytics and run reports for leadership through the free tools Google provides. Pretty handy.